Our town of Medway, Massachusetts has finally awoken to Common Core and PARCC. I am a Medway parent of three children. I oppose Common Core and PARCC. Last night Medway Public Schools Superintendent Dr. Judy Evans held her “Superintendent’s Chat” at the Middle School. She devoted her entire meeting (1hr) to discussing Medway school curriculum, PARCC, & Common Core. She fielded dozens of questions from dozens of concerned parents. I want to publically thank Dr. Evans and Armand Pires for dedicating their time to address our concerns. I suspect that many parents left with many different feelings regarding PARCC and Common Core. Here are my feelings. In full disclosure, I am not an educator. I am a parent. Academically, Medway performs very well compared to other towns in Massachusetts. This is because we have great teachers. We have great administrators. We have a great School Committee. We have great parents. We all hold each other accountable for success. Massachusetts has the best school system in the country. We do not need Common Core. Massachusetts has the most to lose and the least to gain from Common Core. Common Core is untested and unproven. Common Core will cost us money. This year our school budget is unable to accommodate tuition-free full-day kindergarten. Therefore, Medway continues to offer better early education to families of better economic means that those with less. Common Core could burden our ability to fix this. I see no evidence that Common Core helps Medway academically. I see opportunity for Common Core hinder us academically. As Medway strives for excellence above and beyond Common Core standards, we have PARCC testing lurking over our teachers. Teachers are, in part, evaluated by standardized test results. PARCC assessments, per their website, are “aligned with Common Core State Standards, they ensure that every child is on a path to college and career readiness”. First, how do we expect teachers to exceed Common Core standards when an underlying incentive exists to teach to Common Core Standards? Second, I don’t know about other parents, but I don’t send my children to school for “college and career readiness”. I send my children to school to learn about themselves and the world around them. I want their curiosity to be maximized. I want them to learn everything and then turn around and challenge everything. They are not widgets in a government plan. Yet our US Education Secretary Arne Duncan likes to refer to his education goals as “Cradle to Career”. This is offensive to me. Our Federal Government wants to get their hands on our children as early as possible and prepare them for a life of conformity to their status quo: School. College. Work. Retire. Massachusetts signed up for this. We adopted Common Core as part of the federal Race to the Top program where the federal government bribed states with a share of the $4.35 billion pool of money to follow federal education dictates. Our standardized test will be PARCC in a couple years. Our state commissioner of education, Mitchell Chester, is Chair of the Governing Board of governors of PARCC. PARCC will be “chosen”. Sitting in our Middle School last night affirmed my belief that local control is the best way to run education. When Medway is empowered to make its own educational decisions we (Medway) are empowered to make our schools great. Parents. Teachers. Administrators. School Committee. Selectmen. Together we can fix what is broken and leverage what is successful. As we move power over education to the State and to the Federal Government our power over our local schools diminishes – because we have to compete with the rest of the state or the rest of the country for influence over education. Ceding any amount educational control to the Federal Government would defy logic. There is not much that our Federal Government does well. The US is $17 Trillion Dollars in debt. We are addicted to war. We are addicted to spending. Members of Congress are beholden to corporate masters. Laws, regulations, licensing, and tax codes are all crafted for the benefit of big donors and big corporations. Capitalism has been replaced by Crony Capitalism. Common Core is not total nationalized education. I get that. But the arrangement between Race to the Top, Common Core, PARCC, and the financial incentives therein puts us one step closer to national control – from which we will never return. Don’t be fooled for one moment that the integrity of national education is not susceptible to the corruption that permeates Washington DC. When national education becomes corrupted by corporate interests, will we have the power to fix it? When national education leads to massive data collection about our kids, will we have the power to stop it? When national education goals are no longer aligned with our goals, will we have the power to change it? I think Medway will have great schools for the next several years. Maybe longer. At some point, however, parents in Medway will yearn for major changes in the education provided by our schools. 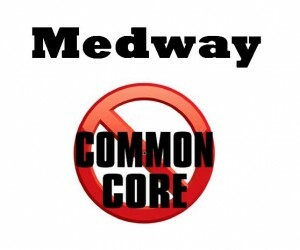 It would be foolish to not oppose Common Core because we have great schools in Medway today. We need to measure Common Core against the unknown scenarios that lay ahead 10 years from now. What if 10 years from now Medway schools are meeting Common Core standards instead of exceeding them? Will we kick ourselves for accepting Common Core? Will we be empowered to make changes? Will we have ceded even more control to the Federal Government? My three kids will still be in Medway Schools 10 years from now. This is real life for me. People in Medway and across Massachusetts have finally awoken to the dangers of Common Core. A petition is going around. Legislation to stop Common Core has been introduced by Representative Keiko M. Orrall. It is Bill HD4197: An Act to Ensure Quality Education. Per Rep Orrall “This bill asks to pause PARCC testing and Common Core until we have a better understanding of the costs associated with this huge change of our educational system”. I support this bill and hope it leads to legislative rejection of Common Core in Massachusetts. For our part in Medway, we need to encourage our State Representatives Jeffrey Roy and Karen Spilka to represent our interests and support this bill. We have so much to lose with Common Core. We have so little to gain. For my Medway peeps, do not be alarmed. You have found my new blog. There is a libertarian in your neighborhood quietly plotting to leave you alone. This entry was posted in Education and tagged Common Core, Freedom, government power, local control, PARCC, Race to the Top by kirk souza. Bookmark the permalink. Kirk – Thank you for the time you invested to articulate so clearly this message to the Medway community. We are grandparents of 3 students in the Medway system and in following the issues surrounding PARCC and Common Core in recent weeks, our hope that been that the ALL TOO SILENT MAJORITY will speak up and ensure that local school officials and state representatives will act in concert with the will of the people they represent. Parents and citizens of Medway . .Do not assume that your local and/or elected officials either fully understand or are supportive of this effort. They have many issues with which to grapple , . this is only one of them and if they do not hear from YOU, YOUR FRIENDS and YOUR NEIGHBORS . . do not be surprised if this effort dies on the vine. This is one of those situations where you are either for or against – remaining neutral or uninvolved essentially defaults to allow THEM to choose for YOU, what THEY think is best for YOUR Children. DO the right thing . .BE There for your Children . . Someday they may even thank you!! !